This chateau-labeled pepper grinder is engraved with a name of up to 14 letters and the vintage year of your choice. A fabulous counter-to-table mill, it's fitted with a cutlery grade stainless steel mechanism that adjusts to a full grind range from coarse to fine. Takes 3/4-cup of peppercorns. Handsomely crafted from maple wood, with burgundy top. Do you sell a replacement screw for the top of the wine bottle pepper mill? Ours came off during a move and was lost. Is the wood light or dark in color? There are two pictures that show a light wood and a dark wood. I prefer the darker wood. BEST ANSWER: The Personalized Wine Bottle Pepper Mill is light in color. It is not as light as shown in the photograph and has a varnish coating, so there is a light shine to it. The wood on mine was the lighter color, exactly like in the photo. I would have preferred the slightly darker, more finished look, but still very nice. So, It’s not as dark as the photo with the person in the white shirt holding it in her hand? Thanks for your answer. Ours is the darker of the natural wood pictures. We love it. We have one and I have given as gifts too and its always a hit. Light wood like oak. I have ordered about 10 of these for wedding gifts. Everybody loves them! All those I have purchased have been light wood. You should call the to find out. I was given one and it looks great, but can't figure out how to use it. Or maybe I'm not filling it correctly. Do you have instructions? BEST ANSWER: its actually very simple..... unscrew the top part [grey] and [ red] then fill it up with pepper corns put it back twist and the pepper should come out!!!! i love mine !!!! i hope this will help good luck Laura G.
No instructions. Unscrew top, pour in peppercorns, then screw back together. Turn handle and cracked pepper comes out the bottom. Unscrew the top, pour in the peppercorns, then screw back together. Turn handle and the cracked pepper comes out the bottom. This is a terrible product. Just put it on the shelf for looks. The mechanism is cheap and doesn't grind satisfactorily. i bought it to give to my aunt. I think it opens from the bottom. So it automatically comes with the word "Chateau" on it? Meaning that whatever words I write will be preceded by the word Chateau, correct? BEST ANSWER: Yes, Chateau is automatically included on the personalized pepper mill. Correct, the word chateau will be on the pepper mill. Do you ship in Canada ? BEST ANSWER: Unfortunately, this ships from the vendor as it is a personalized item and they do not ship to Canada. I would recommend you ship it to a friend in the states who can then ship it to you. 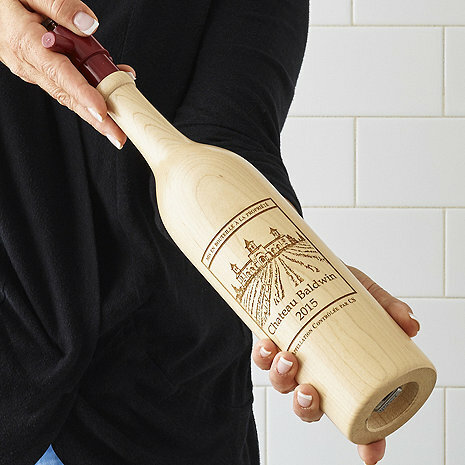 BEST ANSWER: Thank you for your question, the Personalized Wine Bottle Pepper Mill can be personalized up to 14 characters, with word Chateau not included in the 14 characters. I lost the turning Handle from my pepper mill is it possible to get a replacement? Several years ago my daughter-in-law purchased a wine bottle peppermill and salt mill from a winery. I have always admired them. I had recently stopped in at that winery and they no longer carry them. I then went searching on-line and after reviewing many sites that sell them, I chose this one. I liked the design and the personalization. It grinds the pepper easily and evenly. It is attractive by my cook top. I highly recommend it. This is the perfect wedding/anniversary gift! Have given about 6 of them in the last few years. It last for more than 10 years. The bet one we had. It last for more than ten years. We are going to replace it for the same one. This is my go to wedding gift. Everybody loves them! I got this for a friend for Christmas! It was his favorite gift! In fact it was such a hit both his wife and mother in law immediately went to the website to request a magazine be shipped to them!! Not only that but I want one for myself! This product is a guaranteed hit! I bought this as a wedding gift for a friend who has everything. This is a perfect, unique idea and something they'll want to keep forever. I love it so much I'm going to buy one for my husband! This is a wonderful peppermill for friends and family. Personalized name gives a meaningful touch to the gift. Perfect for the gourmet cook or for anyone who likes to entertain. I purchased two of these as gifts. The personalization makes the gift so special and the pepper grinder is as beautiful as it is practical. The fact that it is made in the USA is a plus. Great gift idea. The personlized feature offers the perfect touch! Bought this for a wedding gift several times with year of marriage in it. Always a big hit with bride and groom. Perfect for wedding shower gift! I had two of these made for wedding shower gifts; they were a big hit at both showers! The wine bottle design also fit in well with the vineyard theme of the first wedding. I would recommend this to anyone who wants a unique personalized gift for weddings, housewarming gift, or retirement, etc. Solid wood, hand crafted in the USA! Doesn't get any better than that! Best gift to mark a memorable event! This is my perfect gift for personalizing birthdays, anniversaries & weddings. What a conversational item to have on the table. Doesn't everything taste better with pepper. It is the best pepper mill I have every had. Today, I am ordering two more pepper mills for dinner guests that have to have this pepper mill. I bought one for my daugher, and had to buy one for the other daughter, as she liked it so much. They use it daily, when cooking, barbecueing, and also at the table. Will buy more for Christmas Gifts. I purchased a few of these for Christmas gifts. Everyone loved them. Not the run of the mill gift. No pun intended. I highly recommend!!! This item was a Christmas gift. The friends wanted one like we have. I couldn't fine the exact product, so this one was chosen. The receiver was astonished with the item and can't wait to use it. It's a wonderful item for kitchen use and a wonderful conversation piece. I gave one to my husband about 10 years ago and we love it. We gave one to my sister for her 25th anniversary. We gave one to dear friends last year for their 50th anniversary. We just sent one to our God Son and his wife as a housewarming gift. Putting the year they were married makes it so special. This is a fabulous pepper grinder and everyone loves getting one for a special occasion. I have purchased many of these over the past several years for gifts...they are durable, beautiful, useful and memorable! These are the best Pepper Mills I have seen. I have purchased four of them, plus a Salt Mill. and now getting ready to order a Pepper and Salt Set, and save money. Superb Christmas Gifts, that will be a pleasant surprise, when they see their name engraved. I received this product as a gift several years ago and it is a great conversation piece plus works great and the pepper is fresh. One of my friends admired this gift so I purchased for her birthday and she loves it. Really like that this gift is personalized - it is a gift a loved one will cherish and can be used with all types of pepper!! I own one of these and have for years, my Dad always commented on it, so I finally bought one for him for Christmas! Best Christmas gift ever!! Bought it as a gift...and they LOVE it! It's a great, practical pepper mill! Great gifts for my foodie husband and dad! I love fresh pepper. It is also a great conversational item since our name is on the peppermill. The product was delivered in less than 5 business days, even the month of December. The box it came in was nice enough to leave it in. I have purchased 10 of these now, having just received four more in the mail. Very popular item with my family, and everyone wants a Pepper and Salt Mill to match. Now that they have them, maybe I will get a set for myself. Very attractive, and very well made, and make excellent gifts, for many occasions. This was a 5th wedding anniverary gift. Traditionally, wooden gifts are given - and this gift was perfect. Our last name and wedding year is carved into the wooden bottle. We keep it in the kitchen next to the stove where it is always visible. And it works great too. Very nice gift. We've bought two as shower gifts for newly weds. Both were very well received. We highly recommend as a gift for foodies and winos - they are attractive and practicle. Prompt delivery and packaged well. I've owned this product for at least 8 years and it is the best I have ever owned. Works great with little effort. A must have for any serious chefs. Most people think it's a wine bottle! This is a great peppermill. It does coarse cracking beautifully. It also holds a ton of peppercorns, so you only have to fill it a few times a year. I purchased this item as a wedding shower gift for a good friend. She absolutely loved it. It was one of the most talked about and unique gifts at the wedding shower. Originally, we received one as a gift. We love it so much that we have been giving it as a wedding gift for many friends. I received this within 2 weeks after I placed the order. Much faster then expected! We have given out 3 of these pepper mills and each time the couple we have given them have expressed how much they love the personalized mill. It always makes a 'statement'. I know because I was given one several years ago and it even brought tears to my eyes it was so thoughtful and meaningful. It is truly the best housewarming, anniversary, hostess gift to give. The perfect gift! We have given this as a gift numerous times and it has always been so well received. We even ordered one for ourselves! We use it more for decor but it is nice and fully functional. This is our third "bottle"
The first two that I bought were all wood. I am disappointed that they have switched the top to plastic. I love these. I always give them as gifts,however the quality isn't the same the top is plastic and it used to be wood. Plastic top does not seem too durable for the long run. Nice overall design and look. I received one as a gift. The plastic top and the washer that engages the shaft wear out very quickly. I’m trying to find a thicker washer or find some other way to fix it, but at the price it should last a lifetime.